Tens or Better Power Poker is a simple game to grasp, as it is essentially the equivalent of playing a juiced up version of singled-handed Tens or Better. 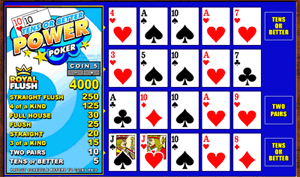 In Tens or Better Power Poker, you play four hands at a time, each dealt from a standard 52-card deck, with no wild cards. The game begins with the player being dealt four rows of five cards each, at which point he must go through each hand, and select which cards he'd like to keep, and which ones he'd like to exchange. The player will then receive new cards in place of the ones that he's opted to discard, and will be paid for hands that are comprised of a pair of tens or higher. Players may increase or decrease their wager amounts using the plus (+) and minus (-) control buttons that appear on the screen. The game's maximum bet is five coins per hand, and its maximum payout is a nice 4,000 coins. Choosing a casino to play this game at can be a tall task, as there are now so many enticing ones to choose from. While many of the most thrilling casinos on the web today operate on software platforms such as Microgaming, or Playtech, these casinos sadly do not accept American players. While the rest of the world can enjoy Tens or Better Power Poker at any of these fine casinos, Global players can still enjoy the game at any online casino running on either Real Time Gaming or Vegas Technology software. • Always hang onto a winning hand unless you've been dealt four cards to a Royal Flush. One of the best places to play Tens or Better Power Poker is at Royal Vegas Casino. This Microgaming powered online casino has been around for years and is considered by many to be one of the best online casinos. They have hundreds of great games to choose from; including plenty of video poker games like Tens or Better Power Poker! At the moment, all new players at Royal Vegas Casino can get up to $1,200 in free casino money on their first six deposits! This bonus money can be used to play Tens or Better Power Poker or any of the other great games at Royal Vegas Casino! Vegas Palms Casino is a Las Vegas style online casino that you can enjoy from the comfort of your own home! They have hundreds of great games to choose from; including slots, table games, and video poker like Tens or Better Power Poker! At the moment, when you make an initial deposit of just $50 at this Microgaming powered online casino, you’ll be eligible to receive up to $100 in free bonus money! This offer won’t last long, so take advantage of it today at Vegas Palms Casino! 7 Sultans Casino is a Microgaming powered online casino that has been in business for several years. In fact, they are one of the oldest and most trusted online casinos. They have virtually every game you can think of; including the always popular Tens or Better Power Poker! At the moment, all new players who make their first purchase at 7 Sultans Casino will be eligible to receive up to $1,000 in free casino money to use on Tens or Better Power Poker or any of their other real money online casino games! We highly recommend Platinum Play Casino to all of our website visitors because they have one of the best casino bonuses in the online gaming industry! At the moment, they are giving away $1,500 in FREE bets with no deposit required to all new players! This is a great opportunity to try out some of the hottest online casino games for free without having to risk a penny of your own money! You can use your free bonus to play Tens or Better Power Poker or any of the other great games that are available at Platinum Play Casino! All Jackpots Casino is a Microgaming powered online casino that features hundreds of the latest casino games; including Tens or Better Power Poker! We always recommend All Jackpots Casino to our website visitors because they are an established and respected online casino that takes great care of their loyal players! Right now, when you signup and make your first deposit, you’ll be eligible to receive up to $200 in free casino money to play Tens or Better Power Poker or any of the other great games at All Jackpots Casino! All Slots Casino, a Microgaming powered online casino, is one of our favorite places to play Tens or Better Power Poker. They have been around for several years and they have one of the best reputations in the online gambling industry. At the moment, all new players at All Slots Casino can get up to $5,000 in free casino bonuses throughout the course of the year. Their bonus structure is fantastic because it guarantees you a free casino bonus on virtually every deposit that you make! At First Web Casino, one of the very first online casinos, all new players can pocket a cool $75 free casino bonus when you make your first deposit! This free bonus money will boost your bankroll, extend your playing time, and increase your chances of getting a big win! You can use this bonus money to play Tens or Better Power Poker or any of their other great games, which include slots, blackjack, roulette, and more! This bonus offer won’t be around for long, so head over to First Web Casino to take advantage of this great offer today! Wild Jack Casino is an eliThis Microgaming powered online casino that is part of the Jackpot Factory group of online casinos. They’ve been in business online for more than a decade and are one of the most prestigious online casinos. At the moment, all new players at Wild Jack Casino are eligible to receive up to $3,000 in free casino money when you make your first deposit. This bonus money can be used to play Tens or Better Power Poker or virtually any other game that you’d like! There’s no telling how long this offer will last, so take advantage of it today before it’s too late! Betway Casino is an online casino that offers poker and sportsbetting to compliment their traditional online casino games, which include Tens or Better Power Poker! At the moment, all new signups at this reputable Microgaming powered online casino are eligible to receive up to $1,000 in free casino money when you make your first deposit! You can use this bonus money to increase your wagers and increase your chances of hitting a big win at Betway Casino! Jackpot City Casino is a Microgaming powered online casino that is offering the visitors of our website two exclusive casino bonuses that you won’t find anywhere else! For a limited time, all new players who signup at Jackpot City will get a free $25 bonus with no deposit required! In addition to this free bonus, they are also offering of visitors up to $1,600 in free deposit bonuses that can be used to play Tens or Better Power Poker or any other game that you’d like! These are limited time offers, so visit Jackpot City Casino today to get in on the excitement!